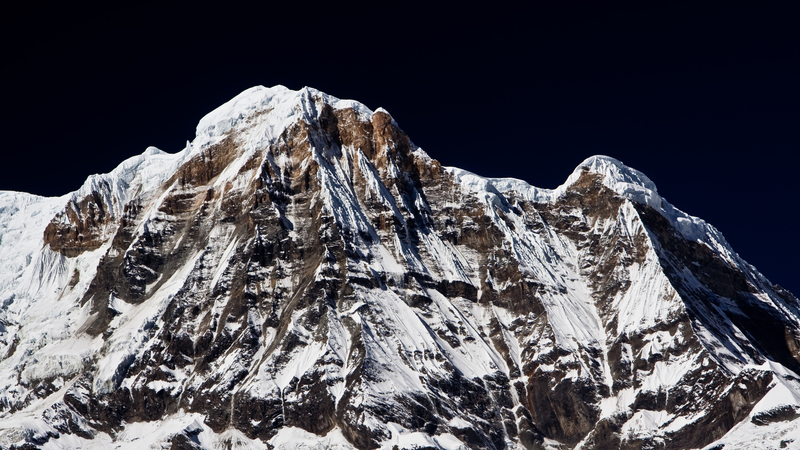 This is Annapurna South (7,219m), Hiunchuli (6,447m), with Annapurna I (8,091m) off-centre to the right of Annapurna South. The shot was taken at dawn from the little town of Chhomrong. Chhomrong sits at about 2,000m, and is most notable because it is built on an incredibly steep hillside so that the top of the town must be 800m higher than the bottom. 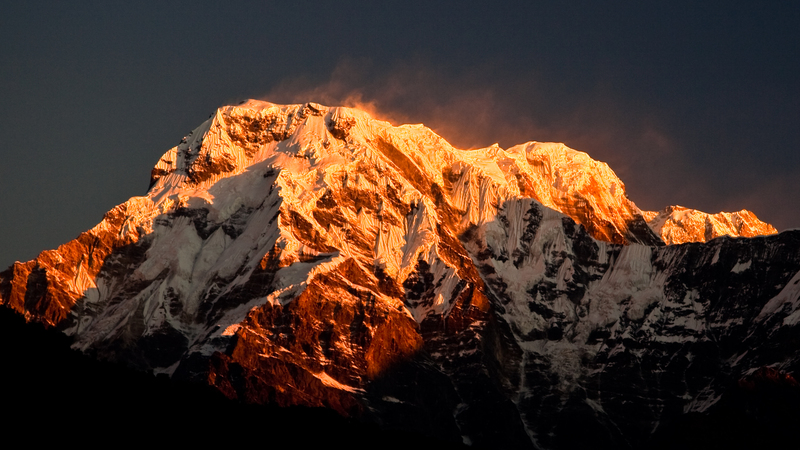 No trekker who has ever climbed to the Annapurna Sanctuary will ever forget Chhomrong because the only path through the town is a broad, uneven and seemingly eternal staircase that runs from the mountaintop all the way to the valley floor. It is brutal on the way to the Sanctuary (downhill). It is a form of cruel and unusual punishment on the way back (uphill). My legs have rarely felt so rubbery. 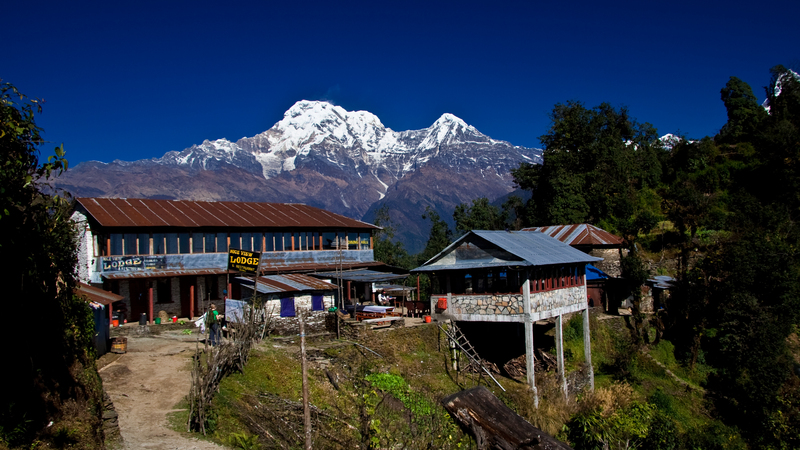 Our Sherpa, Pemba, put us in a hotel right at the top of the town, which gave us a fabulous view of the range. I was up from four a.m. snapping startrails as the clouds lifted, and I caught this shot as the sun was casting low-angled light on the rugged face. Don’t let the titchy image size on the screen fool you. This is actually a three-shot panoramic stitch taken with my 8 megapixel Canon EOS 350D, not a crop, so the image size is enourmous (it was a 250MB Photoshop file post-processing). It was taken using a tripod, and it was shot using a polarizing filter (as most of my landscapes are), but it managed to come out okay in the stitching process. Unusually, I have uploaded the entire hi-rez image (there may be a little JPEGing going on), so I invite you to click the photo above to see it in all it’s wonderful oversized glory, and explore the detail of these awesome peaks.